The disposable food & beverage pump can be part of the packaging, acting as the closure device when the pump is stationary. High accuracy output of the pumped packaging enables precision dosing of concentrated foods, beverages, colourings and flavours. Dispensed liquids can be pumped from pack directly into cup and therefore do not contact the fixed equipment thus minimising cleaning regimes and eliminating cross-contamination and hygiene issues. 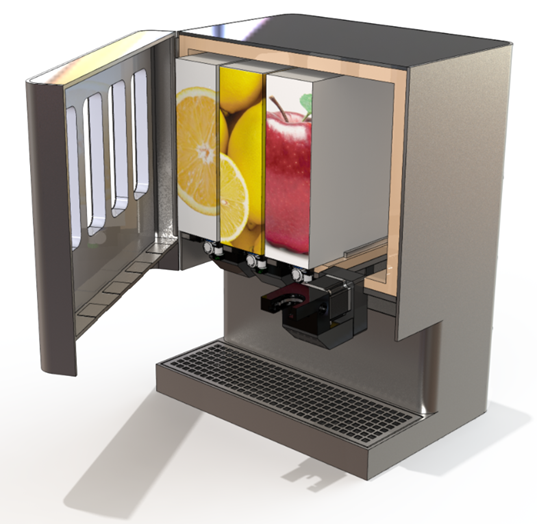 In-pump dilution creates a revolutionary new way of diluting highly concentrated beverages. For example 60% Brix orange juice can be diluted and mixed within the Quantex pump providing a precise dilution ratio cup to cup and no stratification from top to bottom of glass. All mixing occurs within the pump removing the need for cleaning and eliminating the risk of cross contamination. 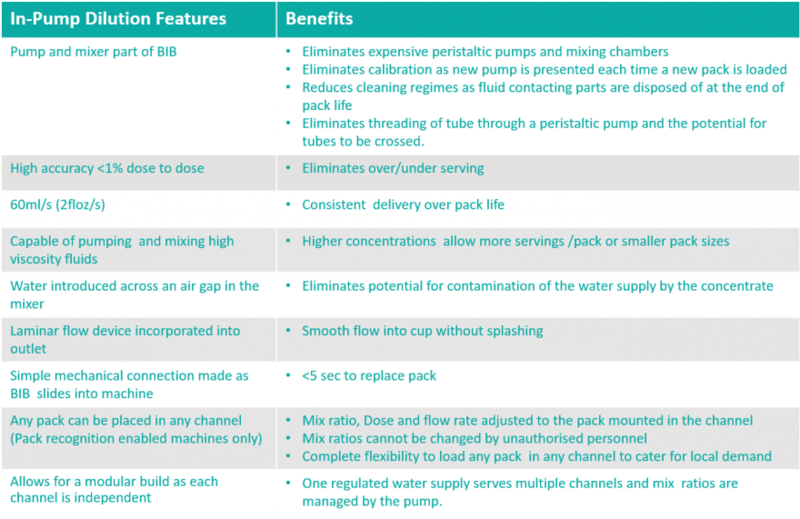 Click here to learn more about in-pump dilution. Reverse cycling of the pump allows the liquid to be sucked back into the pump at the end of dispense thus preventing liquids from drying on the pump outlet. Valves can be attached to the pump outlet to provide a completely clean dispense. Click here to see a video of the BIB-19 pump sucking yogurt back behind a cruciform valve attached to the pump outlet. 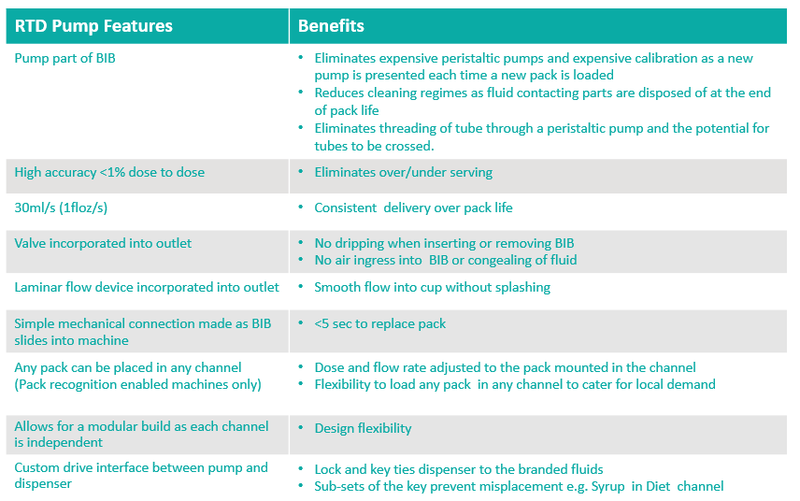 Quantex disposable pumps enable simplification of the dispenser design. Moving/wearing parts are now contained within the disposable pump which is disposed of at the end of pack life, leaving only the motor drive and controller within the dispenser. Calibration is eliminated and maintenance minimised. Unauthorised tampering with mix ratios or dose sizes is prevented and the dispenser size/footprint can be reduced.